Labor Day is a time to celebrate the hard work of all Americans. With many jobs, that hard work ends up wearing on the clothes on employees. Jeans have long been a standard piece of clothing for hard work. Though a good pair can last you a long time, they often don’t last forever. There are other options for retired jeans other than the trash can. What you do with your jeans depends on what condition your jeans are in. If your jeans are in fantastic condition and look barely worn you may be able to sell them. Some consignment stores will buy jeans or allow you to trade them for credit. You can also try and sell them from your own home. Websites like eBay, Poshmark or even Facebook can allow you to do this by signing up and posting a picture and price. Donate them to someone in need. If your jeans still look good, but they just don’t work for you, donate them either to a local organization or a friend. Some local places that accept clothing donations include Salvation Army and Providence Ministries. If the reason you cannot wear them anymore is a rip or that they are ill-fitting, try repairing or altering them. This not only keeps items from being needlessly discarded, but it can save you money as well. If your jeans have a simple tear or a stain, look at sewing over it with a patch, a strip of colorful fabric, or lace. Handy sewers with jeans that are too tight can sew a strip of contrasting fabric to the legs’ length to get more use out of their jeans and add a bit of style. You can turn torn jeans into tons of different items from quilts to aprons to trivets. The easiest up-cycle is turning your jeans into shorts. Start by cutting across the legs to achieve the length that you want. Then add a finished edge with a strip of fabric to the bottom of each leg to give it a new look. For a simple, but cute, craft cut out a stretch of denim that will fit over a can such as a soup can or old pencil cup. Using a hot glue gun, glue the denim onto the cup and press out any bubbles with a ruler. Feel free to add embellishments such as lace or felt flowers to polish off the look. Then store your paint brushes, pens, etc., inside. If all else fails, recycle your pair. 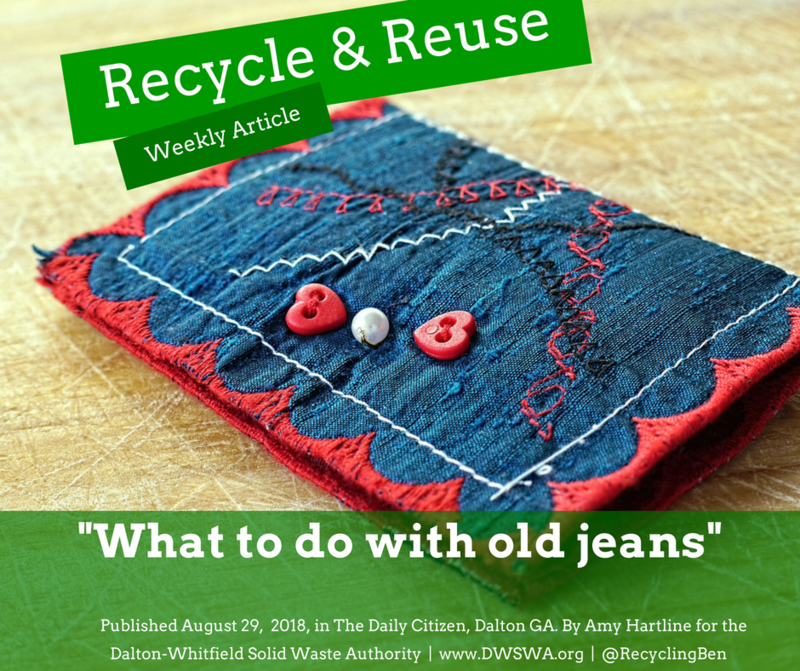 Whitfield County and Dalton convenience centers cannot accept denim or any clothing for recycling. Through a collaboration with Blue Jeans Go Green you can recycle your jeans at J. Crew stores. If you take your jeans to J. Crew for recycling, you can receive a $20 discount on any full-price J. Crew branded jeans. You can also send in your jeans for recycling through the mail. Send your packaged jeans to Blue Jeans Go Green Denim Recycling Program at 431 N. 47th Ave., Phoenix, AZ 85043. Jeans given to this organization become insulation for Habitat for Humanity projects. You can find out more about this organization and mailing guidelines at bluejeansgogreen.org. Part of encouraging reuse and recycling is not just doing it yourself, but by supporting others. Look for brands that make products with recycled or reused materials. The Denim Project helps promote job creation, education and orphan prevention in Haiti. To do this they use worn jeans to create items such as aprons, stuffed animals and other gifts to sell. You can buy these items at denimproject.org to support this effort and keep denim out of landfills. Give yourself and your jeans some rest this upcoming Labor Day by sending them off or turning them into something new. With some consideration most of our items that we normally throw away can be used in an entirely different way.